As the number of cases of Legionnaires' disease continues to grow, testing for this deadly bacteria became an important topic in the water management industry around the world. Not only does routine Legionella testing ensures that water quality and safety is maintained, it also reduces the potential health risks presented by negligence, the unplanned absence of water management staff, failure of biocide dosing systems and a host of other unforeseeable events that inevitably occur within organizations. But what testing methods are available on the market and what are the differences between them? Should only one testing method be used within the organisation, or would using various testing methods allow the business to cover more areas of risk? 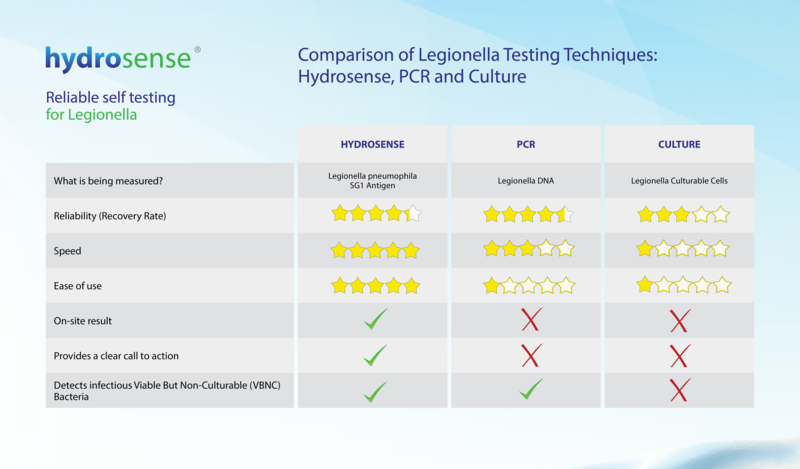 We designed this comparison table of Legionella testing methods to help you better understand differences between the antigen (Hydrosense) test, qPCR technology and the culture method. Hydrosense Test: The Hydrosense test uses Lateral Flow Immunochromatographic Assay (LFICA) technology. The test is designed to detect Legionella antigen, using antibodies tagged with red nanoparticles, which bind to any Legionella pneumophila serogroup 1 bacteria found in a sample and make them visible as a line on the device. In simple terms, the test works just like a pregnancy test, except it detects Legionella antigen rather than pregnancy markers. PCR test: PCR (Polymerase Chain Reaction) testing is a molecular biology technique in which the DNA of a microorganism is extracted and then amplified. This enables the laboratory to determine the presence and quantity of that organism’s DNA in a water sample. Lab Culture Test: The lab culture method isolates and quantifies culturable cells of Legionella. PCR test: PCR can achieve a recovery rate of 90%2. However, this high sensitivity has to be calibrated to reflect the fact that Legionella bacteria are naturally occurring and are present in all water systems at some level. The PCR method thus requires careful interpretation to ensure the relative risk of Legionellosis presented by the system is fully understood. Lab Culture Test: The ISO standard states that in the inter-laboratory trial undertaken, as detailed in the latest version of the standard, the Recovery Rate was only >64%3. That means there is a possibility for up to 36% inaccuracy in any culture test, even when following the ISO standard in an ISO accredited laboratory. Non-ISO laboratories are likely to have even lower recovery rates. 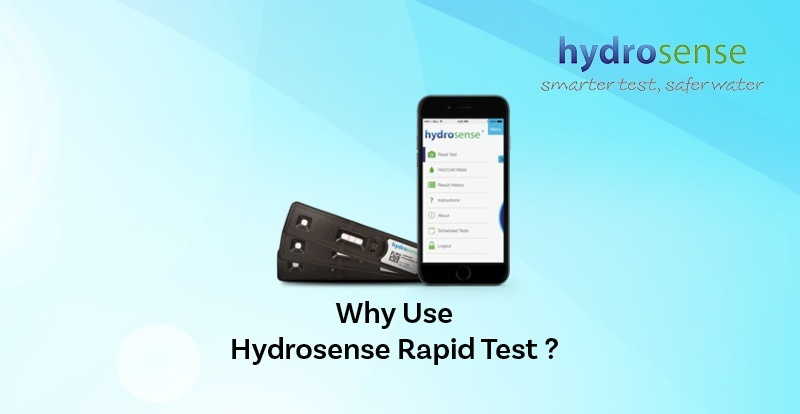 Hydrosense Test: The biggest advantage of the rapid antigen test is time to result. Antigen testing is the fastest method currently available in the world, for the detection of Legionella in water samples. Results are provided in 25 minutes, compared to 7-14 days in the case of lab culture, or ~24 hours in the case of PCR. PCR test: The PCR method is a useful tool for establishing risk under emergency or outbreak conditions because it can produce a positive or negative result in hours rather than days 4, as long as an appropriate lab is close and accessible. It is more typical however, for PCR tests to take between 24 - 48 hours, particularly when shipping to the lab is required. Lab Culture Test: Obtaining a result via the culture method typically takes between 7 to 14 days.Studies have shown that Legionella pneumophila can proliferate very rapidly, potentially doubling in population within a mere 24 hours 5. Consequently, any results received from a lab culture test could be a positive ‘call to action’ that is a week too late, or a negative result which may give a false sense of security for the system being tested. Hydrosense Test: The antigen test requires no training or experience and can be carried out by anyone, anywhere. The ease and simplicity of the test can eliminate the costs associated with sending samples to the lab and is an incredibly convenient way to test for Legionella in remote areas or out at sea. Moreover, the ease of use of the antigen test enables simple, periodic sampling of water systems for the reduction of risk and is a useful addition to any water management program. PCR test: Because the test is carried out in the laboratory, where several steps must be completed, such as concentrating viable cells through membrane filtration; sonication and heating of the concentrated cells to lyse the cells and free DNA; and purification of the DNA for the Polymerase Chain Reaction, the test is very labour intensive and complicated. It requires specialised equipment and must be conducted by trained and experienced professionals. Hydrosense Test: The Hydrosense Antigen test can be performed on-site, which allows detection of the bacteria in its natural environment. Field analyses also remove the risks associated with the transportation of water samples. Currently, the antigen test is the only method for Legionella detection that can be carried out on-site. Lab Culture Test: As with the PCR method, lab test is not carried out on-site and bacteria damage can occur during the transportation process, leading to a less reliable result. Hydrosense Test: The test is specific to Legionella serogroup 1, the strain of Legionella that is responsible for 70 to 92% of laboratory-detected cases of Legionellosis, in the United States and Europe 7. Although the test is able to detect the antigen of non-viable cells in most cases this is unlikely as antigen tends to be removed from a system quickly or will be below detectable levels when there is no active Legionella growth occurring. If the test returns a positive result then action should be taken as the concentration of Legionella bacteria is very likely to be high enough to pose a significant risk to human health. Therefore, a positive result with the antigen methods is a clear call to action for the strain of Legionella which has caused almost all known cases of Legionnaires’ disease. Therefore, a positive result might be hard to interpret, and risk management protocols still need to be established around the technique or the results will be unable to support the decision-making process. Lab Culture Test: A positive Lab Culture result is a positive result two weeks too late – by the time the result is received people have been at risk of infection for two weeks. Conversely, a negative Lab Culture result provides a false sense of security as Legionella populations can double in 24 hours or less 5. A result from two weeks ago is a view of the past which holds little, if any, meaning for today. Hydrosense Test: Legionella, when shocked due temperature, biocide, lack of nutrients or other stress,“shut down” functions that are not crucial to their existence, focus merely on survival and enter Viable but Non-Culturable (VBNC) state. Viable but Non-Culturable bacteria are still very dangerous and can cause an infection and lead to outbreaks of Legionnaires’ disease as they may be resuscitated back to culturable cells under suitable stimuli, such as contact with amoebae11. The antigen test can detect Legionella bacteria in this dangerous and infectious state. PCR test: Similarly, to the antigen test, because the PCR test detects bacteria’s DNA the VBNC bacteria can be detected by this method. DiÃÅaz-Flores AÃÅ, Montero JC, Castro FJ, et al. (2015) Comparing methods of determining Legionella spp. in complex water matrices. BMC Microbiology. 15(91) https://www.ncbi.nlm.nih. gov/pmc/articles/PMC4436101/ [Accessed 22 Jun. 2018]. Y. Buse and N.J. Ashbolt (2011) Differential growth of Legionella pneumophila strains within a range of amoebae at various temperatures associated with in-premise plumbing. National Exposure Research Laboratory, Office of Research and Development, US Environmental Protection Agency, Cincinnati, OH, USA. Letters in Applied Microbiology 53, 217–224. Available at: https://onlinelibrary.wiley.com/doi/pdf/10.1111/j.1472-765X.2011.03094.x [Accessed 22 Jun. 2018]. Joseph, C., Ricketts, K. and on behalf of the European Working G, C. (2010). Legionnaires’ dis- ease in Europe 2007–2008. Euro surveillance, [online] 15(8). Available at: https://www.eurosur- veillance.org/content/10.2807/ese.15.08.19493-en [Accessed 5 May 2018]. Joly, P., Falconnet, P.-A., André, J., Weill, N., Reyrolle, M., Vandenesch, F., ... Jarraud, S. (2006). Quantitative Real-Time Legionella PCR for Environmental Water Samples: Data Interpreta- tion. Applied and Environmental Microbiology, 72(4), 2801–2808. http://doi.org/10.1128/ AEM.72.4.2801-2808.2006 [Accessed 22 June 2018]. Lee, J., Lai, S., Exner, M., Lenz, J., Gaia, V., Casati, S., Hartemann, P., Lück, C., Pangon, B., Ricci, M., Scaturro, M., Fontana, S., Sabria, M., Sánchez, I., Assaf, S. and Surman-Lee, S. (2011). An international trial of quantitative PCR for monitoring Legionella in artificial water systems. Journal of Applied Microbiology 110(4), pp.1032-1044. Available at: https://onlinelibrary.wiley.com/doi/ full/10.1111/j.1365-2672.2011.04957.x [Accessed 22 Jun. 2018]. Delgado-Viscogliosi, P., Solignac, L., & Delattre, J.-M. (2009). Viability PCR, a Culture-Independent Method for Rapid and Selective Quantification of Viable Legionella pneumophila Cells in Environmental Water Samples. Applied and Environmental Microbiology, 75(11), 3502–3512. . Available at: http://doi.org/10.1128/AEM.02878-08 [Accessed 22 Jun. 2018].